Caverns of Xaskazien is a rogue-like RPG in which the player is tasked with descending to the 30th level of a dungeon to defeat the arch-daemon Xaskazien. While original versions of the game only allowed players to play as a generic human adventurer, versions 3.00 onward allow a choice of race among Human, Elf, Dwarf, Halfling or Half-Orc, and class of Adventurer, Warrior, Mage or Rogue. These choices affect the characters' starting attributes, as well as adding unique bonuses or penalties to the character that affect his progress through the game. Dungeon Levels become progressively more challenging as the player descends, with tougher monsters and traps. Most levels are randomly generated as the player reaches them, though there are certain pre-created levels as well, referred to as Legendary Lands. These areas are often tougher to survive than other levels, but also usually carry greater reward. Source: Wikipedia, "Caverns of Xaskazien", available under the CC-BY-SA License. 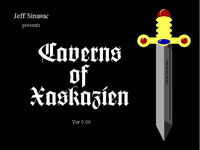 Caverns of Xaskazien has been available as freeware since its creation in 1995. It is currently being updated by its creators to include new content and an updated appearance.